I have so many family Christmas recipes that I tend to rotate them each year, never making all of them in one particular season but some this year, and different next. 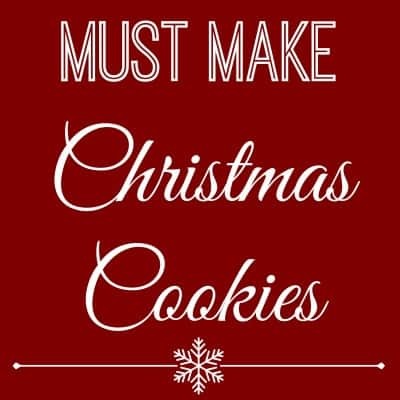 There are a few, though, that are absolute must makes every holiday season. These must make cookies are the ones I’m sharing with you today. I don’t do all of my baking at once, but spread it out instead. I’ve been working on Holiday baking for well over a month now. I’ll bake treats and give them to different folks here and abouts as they get made. What friends and family get all depends on when I happen to catch them and we have a constant fun variety around home. There isn’t ever a whole table of a variety of cookies or anything like that, because I make different cookies throughout the season and wait until we’ve enjoyed those (or given them away) until I make the next batch. This keeps our holiday baking a light and fun experience and it never seems like a chore or work because we don’t ever have that one day where we feel like we have to bake ourselves to death in order to make a cookie tray look nice :). 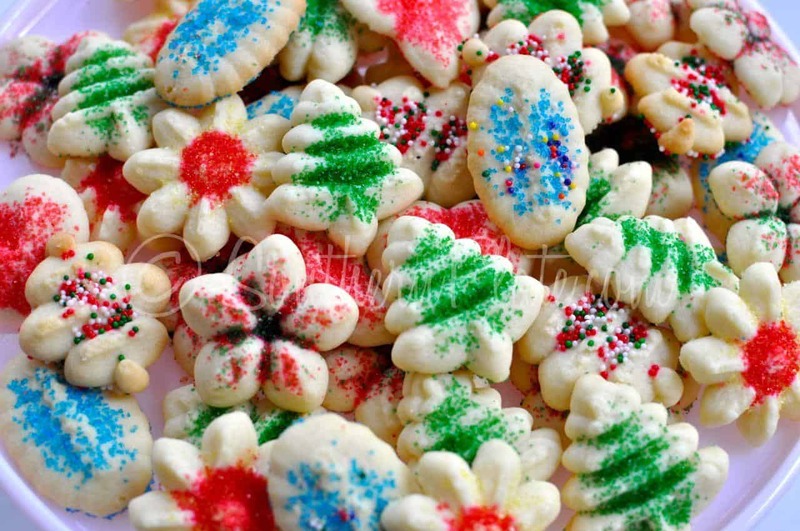 These cookies were a very important part of my childhood. So important, in fact, that I just couldn’t wait to make them with my firstborn. The fact that he was just shy of six months old when his first Christmas rolled around didn’t deter me, either! I had my husband hold him up on the counter (he couldn’t even sit up on his own yet) as I rolled out the dough. I’d place a cookie cutter down on the dough and use his little hand to gently press it in. Brady would light up and laugh with each new cookie, even though he had no idea what we were doing! As important as they were to my childhood, I think they have become even more so to my own children. Decorating these cookies is the last thing we do each year on Christmas Eve, before they head off to bed. My husband’s parents come over from Georgia and we all get in on the action. I give everyone a dozen or so cookies and line up bowls of colored icings (the icing is the quickest part to make), sprinkles, and various decorations I’ve acquired throughout the year (I use this activity to clean out my sprinkle pantry) and stand back and take pictures. Even though I’ve come to expect it, I’m always taken aback at how much fun the generations have together decorating these cookies. You’ve never seen young and old have so much fun! This is always a hectic time of year. For me, though, commercialism isn’t to blame – I finished my Christmas shopping a few months back. It is just that there is so much to celebrate and so many wonderful things to do in such a short time. If I had my way, the Christmas season would last twice as long. But it doesn’t and last I checked no one was interested in my opinion on the matter :). That is why these cookies are such a wonderful lifesaver. For that day when you planned on coming home and making cookies with your kids but just found yourself one thread short of being completely frazzled, these cookies make life easy again – without sacrificing taste, beauty, or the fun of getting into the kitchen with your younguns. In my younger days, I thought these beautiful Spritz cookies looked so painstakingly perfect that they could surely only be made in factories. Then I purchased my first cookie press and was surprised to find they were the easiest shaped cookies I’d ever made! All it takes is mixing up the dough, chilling it, and then spooning it into the press. A light sprinkling of candies or colored sugars gives that magical Christmas look that has folks veering to the cookie platter first thing! There is something about taking a bite out of the soft crunch of a meringue cookie and having it instantly melt in your mouth. When you add in studs of chocolate, these cookies get even better. My nephew likened the experience to eating clouds the first time I made them for him, thus the name. 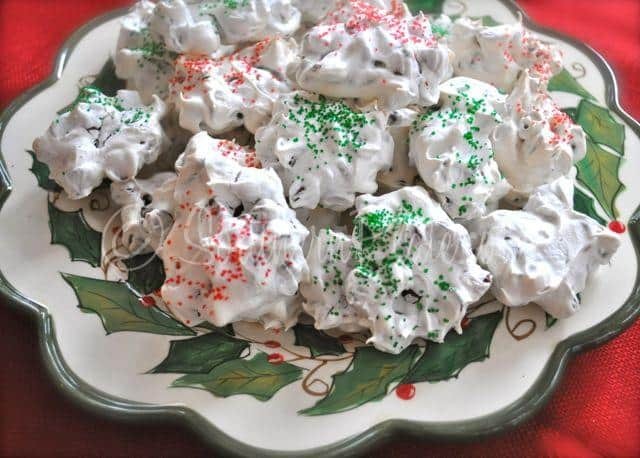 Meringue cookies are surprisingly simple to make, too! Wanna see me break out into a big grin? Mention these cookies! 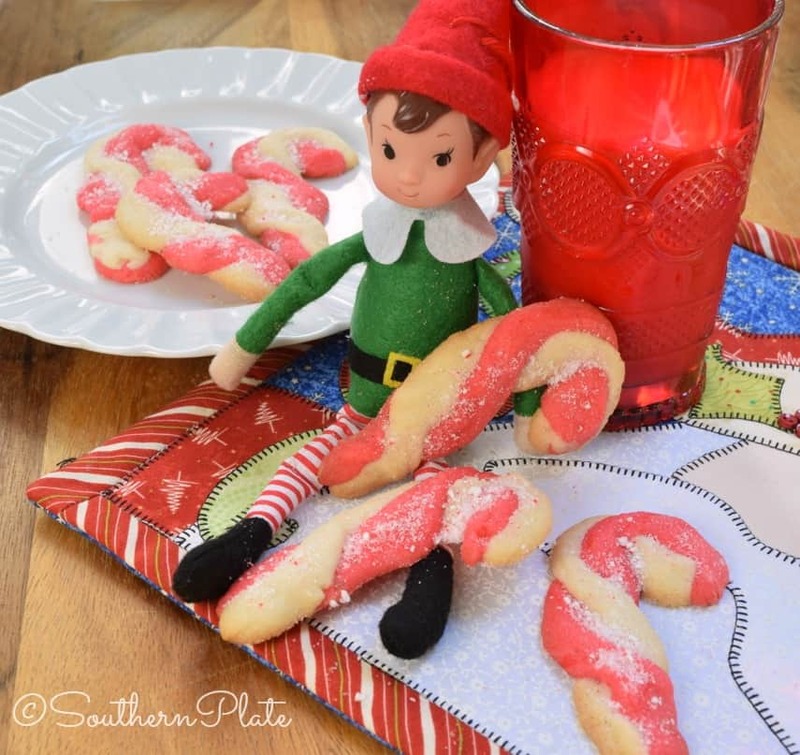 You’ll have to read the story of how Mama crushed the candy canes in the post to see why. Add to that the fact that they are absolutely delicious and cute as can be and you know why these are on my “must make” list! 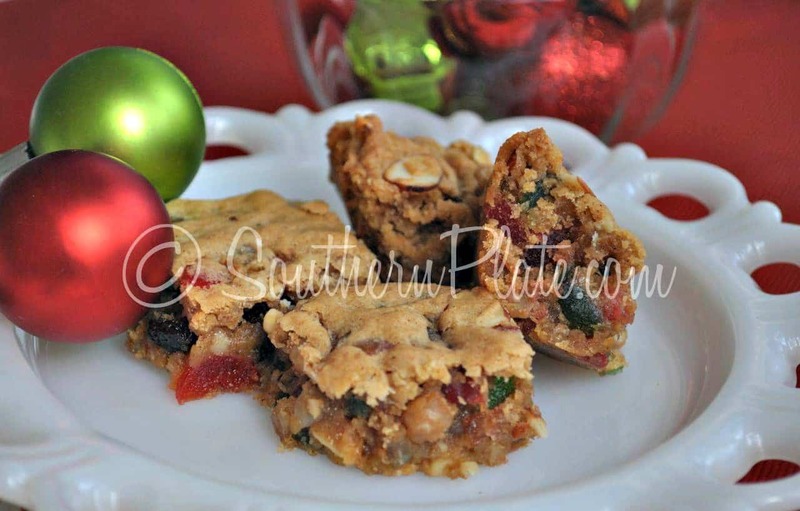 I’m not a fruitcake gal, especially the liquor soaked ones that you can smell long before you even have a chance to take a bite. But I love these deliciously spiced, moist, fruit studded bars. They take fruitcake to a whole new level for me. It helps that they start out with baking mix, are stirred together by hand in just one bowl, and then patted into a pan to keep the low fuss momentum going. And here is the secret about these cookie bars – you can switch up the ingredients and morph them into pretty much any cookie you want. Check out my chocolate chip version or oatmeal scotchies to get ya started. Try peanut butter chips, M&M’s, or even cinnamon chips for a fun switch up! Later this week, I’ll be sending out my Must Make Christmas Candy recipes! Make sure you subscribe to my emails so you won’t miss it. There is a box to sign up in red below entitled “Enjoy this post? Never miss another!”. I am the only person who will ever see your email and I generally send out 3-4 emails a week, but I sometimes send out one or two more during the holiday season. Thank you so much for sharing all of your wonderful recipes and experiences with us. I can relate to all of your stories about family because we were always close and had family dinners. Love all of them!!!! Dumb question but how do you substitute all purpose with self rising flour? No such thing as stupid questions here :). When substituting self rising for all purpose, it is important to know that self rising already has leavening agents in it so you need to look over the recipe and remove those. In particular, omit salt and baking soda or baking powder. Now keep in mind that some recipes have more or less leavening than is in the standard of self rising flour so your final product may rise higher or less than the original recipe intended. However, in my personal experience, it is very rare that the desired result isn’t the same, just with less fuss from having to use fewer ingredients and do less measuring. In fact, I can only think of two times in my cooking history that the substitute didn’t go off without a hitch. For me, it’s worth the risk :). If I ever substitute and it doesn’t work out, I just make a note not to do that again on that recipe (unless I like the new results better!). Please advise where I may find a way to make VANILLA STRIPS COOKIES from Almond Paste not the traditional ground almonds and powdered sugar. Christy, I can’t wait for that third book. Do you know about when it’s coming out? I don’t have any idea just yet Marsha, but as soon as I do I will let you know!! So glad to get your new book on Kindle as well… now I can carry it with me on my tablet. Also got it for my daughter so we both have it to enjoy. I just hate Kindle because I don’t get the pretty pictures but at least have the recipe when I want it. Cooked with my laptop in the kitchen over Thanksgiving but decided not to do that again unless I get a key cover for it for the stuff that got over in the keyboard. Merry Christmas and God bless you real good! Christy, this is the best looking compilation of holiday cookies that I’ve seen yet! I want at least one batch of each. 🙂 Pinned! I look forward to taste testing soon! A very Merry Christmas and a year full of blessings to you Lo !! Thank you so much for all of your love and support, I cherish each of you more than you could ever realize!! Christy, when you make up your little sacks to give away to neighbors and such, how many of each item do you put in the bag? I am trying to determine how to distribute. I have made all 3 fudge, Holly Jollies, Red Velvet Cookies, Cream Cheese Divinity, and Tiger Butter. WOW! Can you come help me so I can move into your neighborhood real quick? I decide based on how much I have and how many gifts I need to give, and then add five or six extra because I know my kids and their last minute remembrances ;). If I had made all of that, I would use those little party favor bags and maybe do four pieces of fudge, 4-6 holly jollies, 2-4 red velvet cookies, a few piece of divinity, and a couple of breaks of tiger butter. You can also opt for giving each person different things and just giving them a lot of it. One neighbor gets fudge, one cookies, etc, but I think the sampler package would be awesome! And again – WOW! Thanks Christy!! I have had fun doing this. I make my mom’s recipe for old fashioned sugar cookies using the cookie press. One year when I made some for a church bake sale, a woman came up to the table and said those aren’t homemade cookies. I said yes they are I made them. She couldn’t believe anyone could make cookies look that good I guess. 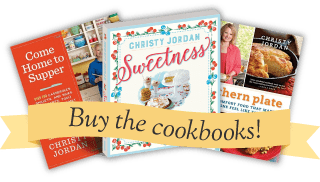 Thanks for all of the great candy and cookie recipes. I make a lot of fudge, cookies and candy to make up boxes for family and friends. I usually make up about 30 shirt size boxes each year. It is a lot of work, but I enjoy making all of it. 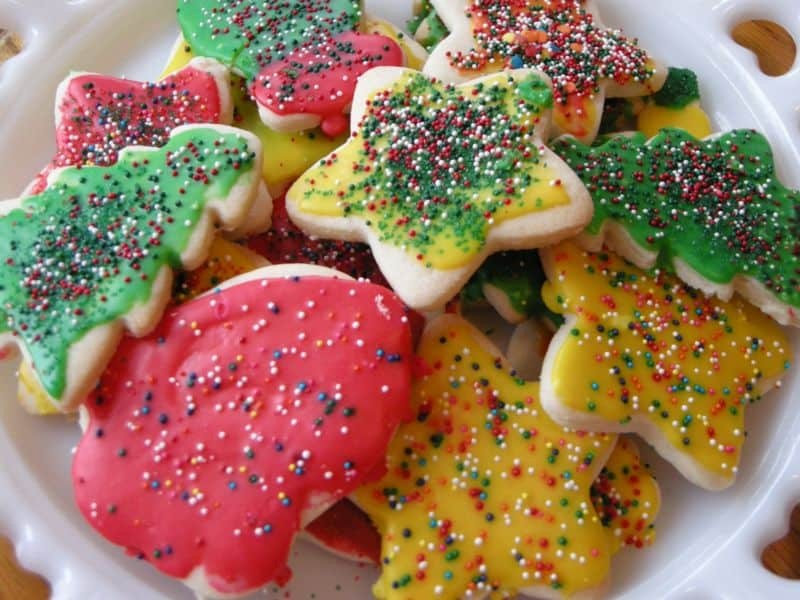 Are your sugar cookies soft or crunch? . 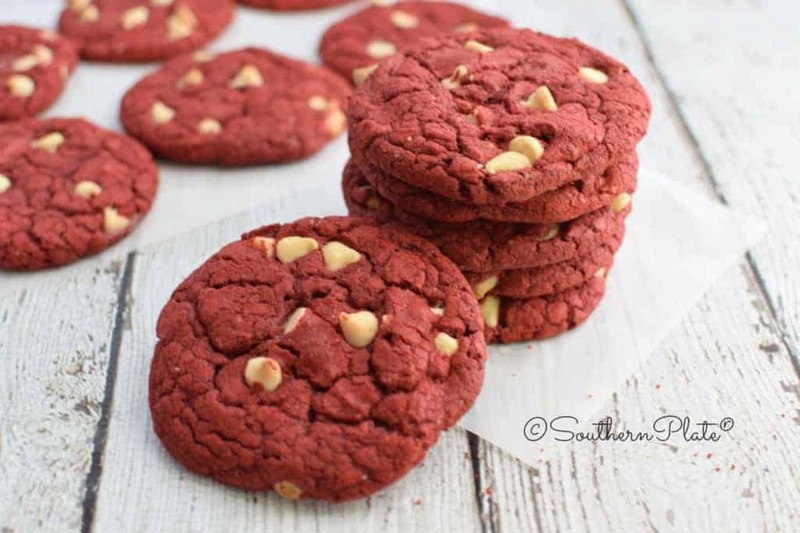 I am looking for a soft, chewy sugar cookie recipe. Hi, happy holidays. I was wondering about the devotionals, I haven’t seen them linked in. I have been raving to my friend who is a babe in Christ about your monthly devotional. Good Morning Leticia! If you look up in the top right corner of Southern Plate you’ll see “Christy’s Corner” and “scripture writing”. Those two are probably what you are looking for. If you are more interested in daily (ish) writings that I often put out in the morning those take place in my fellowship group on Facebook. Hope you have a blessed Christmas! Thousand thanks, Christy – how blessed we are to have you in our lives…!!!!! Love…love…love…!!!!! My son was barely over a month on his first Christmas and I had him in his lil chair “helping” make cookies. My grandma and I used his hands to decorate some of the cookies with icing. Cant believe that same baby is turning 10 tommorrow. I had forgotten about all that until I read about your son. Thank you for sharing your memories and recipes. I really enjoy reading every post. I love your recipes, but even more, I love how you encourage my heart. Thank you for being a sweet blessing. I hope you get the chance to try a few Anita!! !